SPECIAL ORDER ONLY. 14 - 16 weeks of waiting time. This appealing living room set is not ordinary one, due to its unique combination of a sofa, loveseat, and chaise for lounging around in your leisure time or just kicking back in front of the tube. Sale Price is for 3 pcs set . The front is made of top grain Italian leather and the back is durable high quality leather match material. Sofa W93" x D39" x H34"
Loveseat W74" x D39"x H34"
Chaise W30" x D64" x H35"
Black, Espresso and White - SPECIAL ORDER. Please, contact us if you would like to place your special order for any other color. It will take 14 - 16 weeks to get a special color aside from the available stock colors. Ultra Modern Unique Design. Orange Leather with Wenge Wood Finished Accent. Modern Profile Design, Adjustable Headrests. Italian Top Grain Leather/Leather Match. Top Grain High Quality Leather, Made in Italy. Modern Leather 2Pc Sofa Set. Available in Red/Black, White/Black, Beige/Brown. 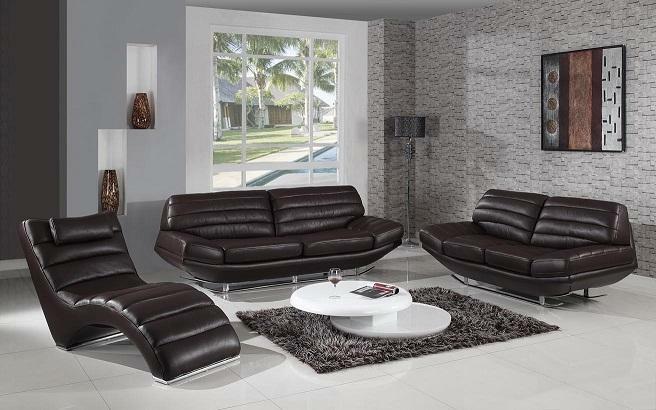 Modern Leather 2Pc Sofa Set. Available in Black, Ivory and Red. Innovative, contemporary styling. Different Color Options.